Love Bongo’s Bingo? 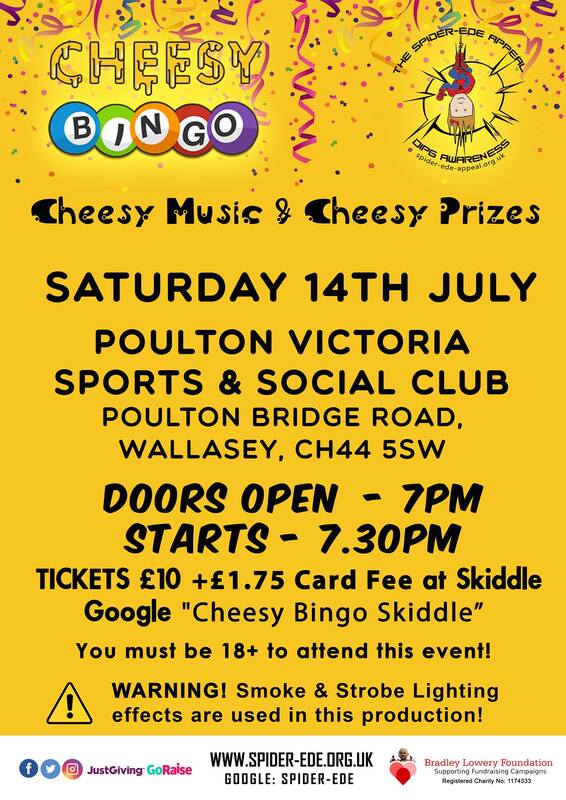 Then you will love 🧀 Cheesy Bingo on Saturday 14th July at the Poulton Vics in Wallasey! Play Bingo! Dance to Cheesy Music and win Cheesy Prizes! If you fancy joining us for a good night out then you can get your tickets online from Skiddle. Tickets cost £10 plus £1.75 card fee. Please note, you must be 18 or over to attend. Join us for an evening of fun and laughs at our Bingo night with a side of raffle. How much? £5 for half a book, £10 for a full book. Dabbers on sale for £1 too. Raffle tickets available as well. Comment on here or drop Sarah an email if you want to join in the fun! Ladies night fundraising event for The Spider-Ede Appeal! Tickets are £10 and there are 80 tickets available. The night will include an Ann Summers Party, Burlesque class, Bongo’s Bingo style Bingo, and raffle. There will also be willing male victims allowing a strip of wax to be ripped off at the event for the bargain price of £2 per strip! All proceeds will go to the Spider-Ede fund! ❤️💙❤️💙 for tickets please make contact via our facebook page.